Finally, the combination of informational and experiential spaces finds an especially pleasing and appropriate home in children’s literature...[specifically in] the classic domestic array of Margaret Wise Brown and Clement Hurd’s Goodnight, Moon... [the pleasure of] this book has a great deal to do with its perfect blend of knowledge and experience, of itemization and immersion. The argument that gets us there can be tracked here. Having spent a great deal of time with this book in years past, always in the intimate company of my then-small sons, I think this is formulation is correct. 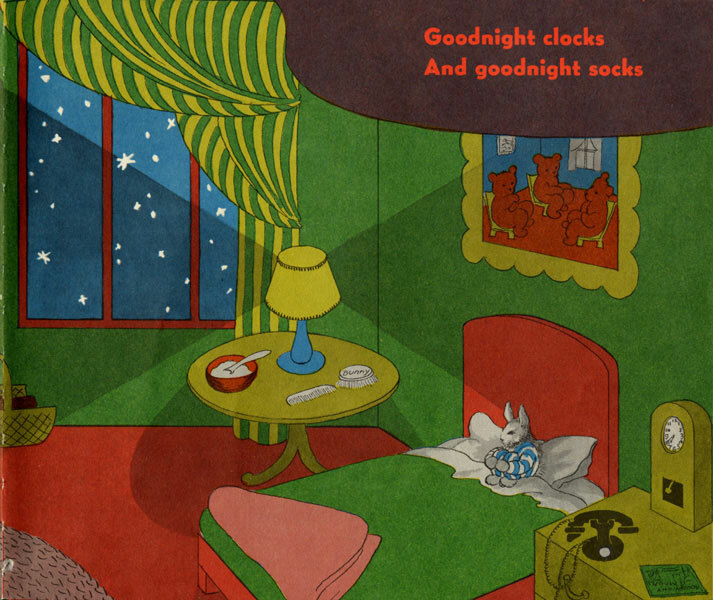 The reader/listener/viewer of Goodnight, Moon works back and forth between the methodical enumeration of beddie-byes to various items and friends, and the gradual darkening of the room and corresponding glow of the nighttime sky. The child is satisfied by the act of checking off as she tumbles toward the experiential murk of quietude and slumber. For our part, we revel in the complimentarity of knowing and being. Because in the most important ways, we never cease to be children, if we know what's good for us. Bravo and thank you to Margaret Wise Brown and Clement Hurd. The book is 60 years old this year. That's a lot of gentle Night-nights. Clement Hurd, illustration for Goodnight, Moon, by Margaret Wise Brown, published by Harper & Brothers, 1947. Clement Hurd, the concluding illustration in Goodnight, Moon.